(Easy Piano Songbook). 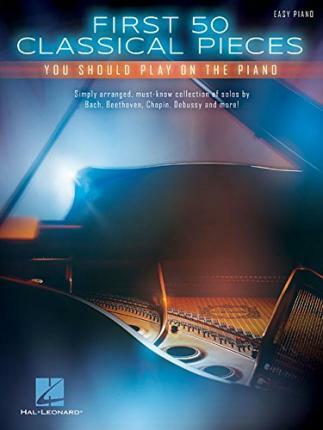 A great collection of 50 must-know classics for all pianists, including: Arabesque, Op. 100, No. 2 (Burgmuller) * Ave Maria (Schubert) * Can Can (Offenbach) * Canon in D (Pachelbel) * Clair de Lune (Debussy) * Eine Kleine Nachtmusik (Mozart) * Fur Elise (Beethoven) * Hallelujah Chorus (Handel) * Hungarian Dance No. 5 (Brahms) * Largo from Symphony No. 9 ("New World") (Dvorak) * Meditation (Massenet) * Minuet in G (J.S. Bach) * Ode to Joy (Beethoven) * Pavane Pour Une Infante Defunte (Ravel) * Pomp and Circumstance (Elgar) * The Surprise Symphony (Haydn) * Waltz in a Minor (Chopin) * William Tell Overture (Rossini) * and more. Each arrangement is simple and streamlined, yet still captures the essence of the tune!